This weight loss soups article discusses 5 cooking tips that can make Chinese soups good for dieting and offers one recipe as reference. Some people have said that weight loss from 100% dieting will result in a rebound and that the weight gain will exceed what was lost. I mean, if you eat like a mouse for 1 month, and then revert back to what you always eat, you are going to gain back all those weight. Some people have said that if you don't control what you eat, no amount of exercise is going to help. I have to agree, If you run 5 km and then sit down and eat a full burger meal, you just negate all your hard work. Recently, a couple of articles claimed that successful and permanent weight loss is 80% diet and 20% exercise. The issue is that permanent weight loss is only possible with permanent diet and lifestyle changes. If you use short-term diet plans, then your weight loss would be short-term too. Fair? And I think changing your diet to include some weight loss soups shouldn't be too difficult? Especially if you follow the tips below. Excessive intake of salt causes fluid retention and bloatedness. Our modern lives meant that we consume excessive salt without even knowing it. Many food sold outside contain a lot of hidden salt. Salt is a good flavour enhancer and preservatives. The combination of ingredients and other additives in food meant that they don't necessarily taste salty. It is easy to cut down on salt in homemade Chinese soups because the fresh ingredients have natural flavour and sweetness. it means you will naturally need less salt to season your soups. Use lean pork instead of fatty cuts to make your soups. 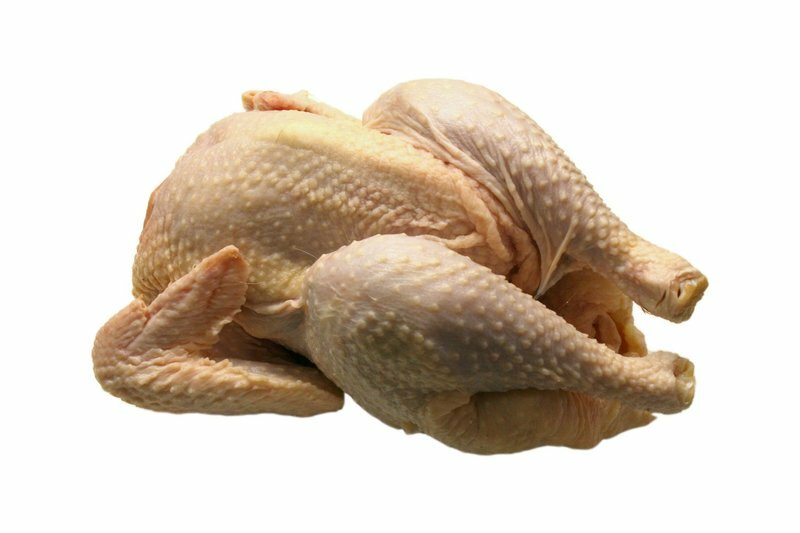 Remove the skin and any excess fat sticking to your meat cuts. Scoop out the thin layer of oil floating on the soup. This is quite easy to do. If you have the time, let your soup stand for a while. The oil will naturally float to the surface and you can scoop it out with a spoon or soak them up with a blotting paper or kitchen towel. Instead of drinking your soup with rice or noodles, use more roots and tubers such as carrots, lotus root, arrowroot, chinese yam and more. Fresh Chinese yam, taro, and lotus root are made up of complex carbohydrates and take the body a longer time to digest and convert to glucose. They keep you fuller for a longer period of time. They also have other micro-nutrients good for your body. When making quick boiled soup, add a lot of green leafy vegetables like bok choy, water spinach, chye sum or choy sum. They provide good dietary fibre which improves the cleansing of your colon. A clean healthy gut improves digestion and eases constipation. Green leafy vegetables also contain a higher amount of calcium and Vitamin C.
Try as much as possible to use homemade soup stock. Make them ahead of time and freeze them for later use. Store-bought stock are usually high in sodium and preservatives. If you really need to use store-bought, read the nutritional label to make sure you get the one with the lowest sodium level and do not have too much ingredients that you cannot pronounce. While your diet is an important part of any weight loss regimen, there are other ways to support your healthy lifestyle. Boston has a lot of weight loss deals you can take advantage of in order to meet your weight loss goals. I know these tips work because I lost inches after drinking Chinese soups. I have always had some puppy fat. You know, a slightly round face, a slight double chin, and a medium-sized body. I was like that for so long that I thought this was my optimal size and weight. I wasn't fat, I don't over-eat, I don't snack, I don't drink soft drinks, and I eat my vegetables. I did not think it was possible for me to be any thinner or lighter (other than if I am seriously ill). One day, I came across a book called Natural Health, Natural Medicine: The Complete Guide to Wellness and Self-Care for Optimum Health written by Andrew Weil. I paid particular attention to one of the sections on cancer because my mum had breast cancer. And the doctors said that I am high risk. The book covered a variety of ways food can become oxidated and therefore carcinogenic. For example, heating cooking oil until it smokes can cause the oil to oxidize and over-consumption of oxidized oil may lead to high risk of cancer occurrence. After reading the book, I walked down rows of food stalls in the food centres near my workplace observing the various ways the stall vendors were preparing their food. I saw the smoke from their woks. I saw refined carbohydrates everywhere. I may have been paranoid then but I just could not bring myself to eat any of those foods even though they smell and look great. What shall this hungry girl do? Finally, I settled on a soup dish called 酿豆腐 (niang dou fu). This distinctive characteristic of this dish is that the tofu and some vegetables are stuffed with fish paste. 酿 means "to stuff". A niang dou fu stall with rows of fresh vegetables and stuffed food items. 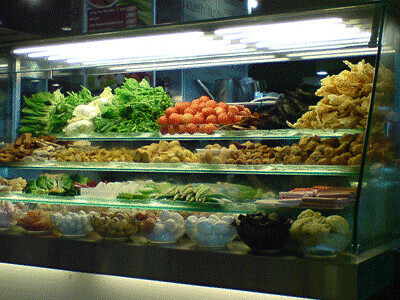 At the stall, the vegetables, meatballs, fish balls, mushrooms, eggs, tofu (beancurd), and an assortment of fried items are arranged in rows like a self-service salad bar. I can pick any number of items and add egg noodles, rice vermicelli or even steamed rice as the main carbohydrate. I usually choose the fresh green vegetables such as bok choy, chinese spinach, water spinach or napa cabbage. I will also choose some of the stuffed items. I will also asked for all the items to be served in a hot broth with rice vermicelli. 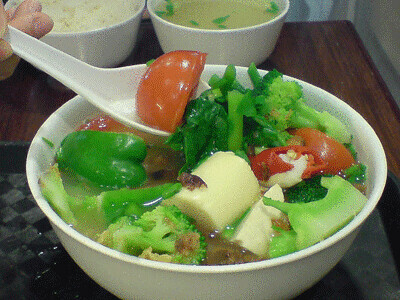 A bowl of fresh vegetables in soup. Apart from picking different types of green vegetables to increase variety, I basically had this dish for lunch for the next 2 to 3 weeks. Would you believe me if I tell you that just after 2 weeks my dress size went from a medium to a small? SERIOUSLY, all my skirts and pants were so loose after those 2 weeks, I had to start shopping again. I was not looking for a weight loss system. I was looking for ways to prevent cancer and I lost weight instead. It was only a slight change in my lunch choice and I lost inches, and more importantly, I lost them from my hips and lower back. I did not know it at that time, but my body had been holding extra fluids due to all the hidden salt and refined carbohydrates in my meals prior to my lunch change. Once I cut them out from my food intake, I shed the excess water and lost the inches. Filling up with healthy weight loss soups, I got my nourishment with fewer calories. 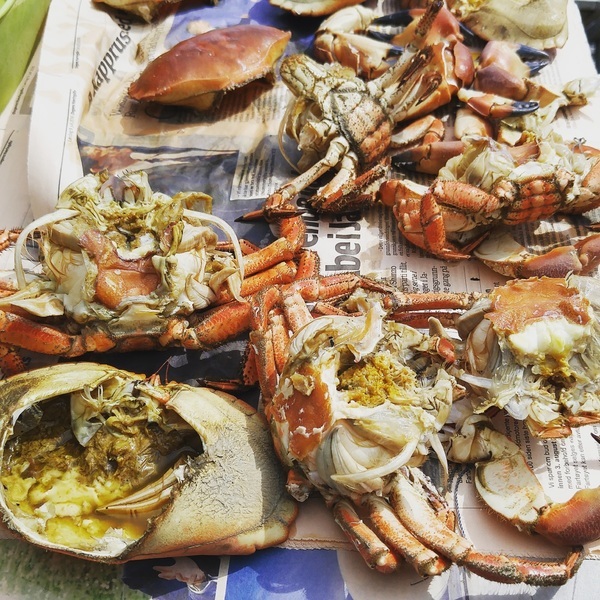 酿豆腐 is a unique Singaporean food and I don't think it is available outside of Singapore except maybe Malaysia. You may not have the same dish at your location, but the principles of weight loss are the same. There are many reasons why people gain weight. Weight can come from water or fat. If you are overweight, it is better to find out why first before you try any weight loss programmes. Most weight loss programmes do work but usually for people with the causes these weight loss programmes are targetted to resolve. Not everyone has the same causes. Having said that, many weight problems are caused by eating, not just over-eating. The amount of food consumed is of course important especially for people who are so used to eating a lot. But the kinds of food that are being consumed also matter. Drinking a variety of soups (exclude thick soups containing cream) in the long run will help to maintain health and weight. No pills no surgery, just a simple natural dietary approach that requires only a change in meal planning. A pair of fresh Chinese yam. This low fat chicken soup uses lean chicken breast meat, arrowroot and fresh Chinese yam. No cream, no butter, no oil, no other animal fats. Arrowroot and chinese yam provides complex carbohydrates and will help keep you full much longer. Some people tend to avoid all carbohydrates when they are dieting. The theory is that the body will burn fats if there are no carbohydrates to use as fuel. The problem is that they become hungry very quickly and it is hard to fight the urge to eat when hungry pangs call. A moderate amount of complex carbohydrates is still necessary. I think this is a great soup for people concerned about weight gain because it has bulk and thus satisfies your hunger pangs. The fresh Chinese yam, carrot and arrowroot will turn soft and fall apart if the water is boiling too vigorously. Once the water boils, lower the heat to a medium simmer. If you cannot find fresh chinese yam or arrowroot, replace with potato. Omit the ginger if you do not like it. Okay, that's all I have to say about weight loss soup. I hope this will encourage you to try to create your own weight loss soups, especially with some of the recipes on my website.